Rowan University is located in the southern New Jersey town of Glassboro, 18 miles southeast of Philadelphia. The campus is easily reached from the N.J. Turnpike, the Atlantic City Expressway or any of the Delaware River Bridges. The Welcome Gate is located at 257 Mullica Hill Road, Glassboro, NJ 08028. Please follow signs for Route 322 West to campus. Please follow signs for Route 322 East to campus. From Route 47, make a left (or right) onto Donald Barger Blvd. Follow Barger Blvd. west to Carpenter Street. From Exit 48, proceed North on Route 641 (Ellis Street) to High Street. Make a left on High Street and find residential parking on High, Victoria, New, Holly or Oakwood Streets. 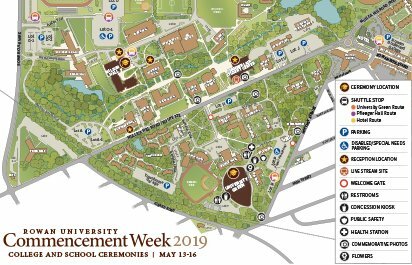 Posted time restrictions are lifted during Commencement Week. Please be careful not to block driveways and intersections. From Exit 50A, take Route 322 East to campus. Please note: This route is the most heavily traveled. From Exit 53, follow Route 553 South (Woodbury-Glassboro Road) through Pitman to Route 47 (Delsea Drive). Merge onto Delsea Drive and continue south to the first traffic light. Make a right onto Donald Barger Blvd. west. Follow Donald Barger Blvd. to Carpenter Street.